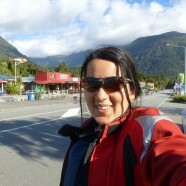 Home » Posts Tagged "Franz Josef"
Yesterday I went for a short ride about 25 km down the road to a place called Okarito. It was about 19 km down the main road after which I turned left onto a twisty, narrow 8 km stretch. This road was fun to ride except that I was heading west and the sun kept blinding me in certain sections, forcing me to slow down. It ended in a little blue lagoon where some people were fishing. I loved how the vegetation on the sides of the road was full of rainforest-y trees and ferns. 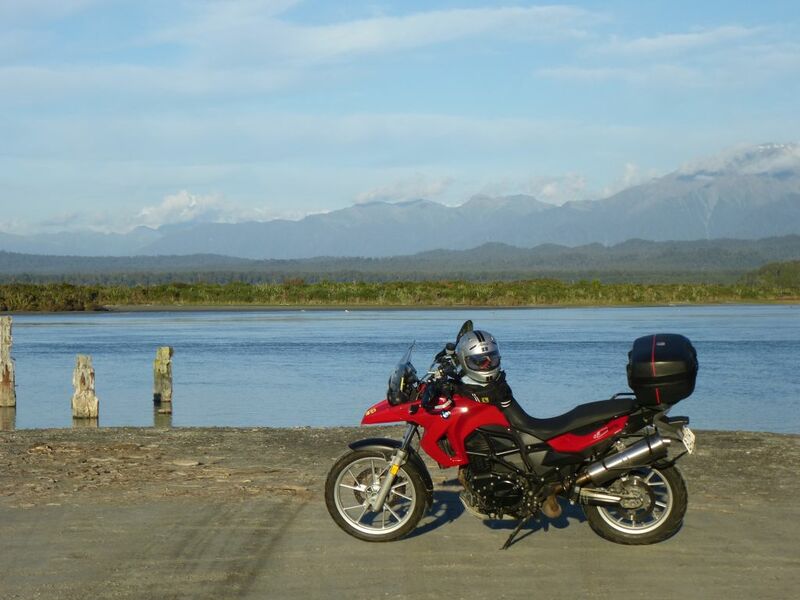 The ride back was a lot faster and I gasped as I saw the snow-capped mountains in the distance on my return journey! 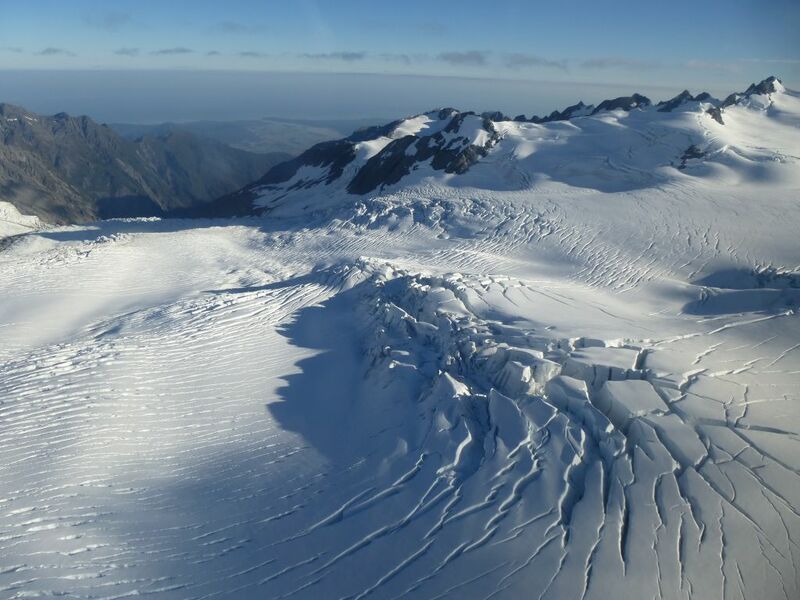 This morning I took a helicopter tour of the two glaciers in this area – Franz Josef and Fox Glacier. I had booked a 9:00 AM flight – a bit early because I really wanted to sleep in but I’m kinda glad I went early when visibility was really good. When I had inquired about the tours, I found that I could pick either more air time and 8 minutes on the mountain or for a bit more money, less air time and 3 hour guided tour on the mountain. I was going to do the latter but the Quebecois guy at the counter talked me into the former, saying that everyone loved the views from the air and wish they could have gone longer. In hindsight, I should have gone with my first decision. I mean the time in the air and the incredible views of the mountains were great but I really really loved being on the glacier itself and feeling the ice crunching under my boots. And the tours are so expensive that I couldn’t just go do the heli-hike later. 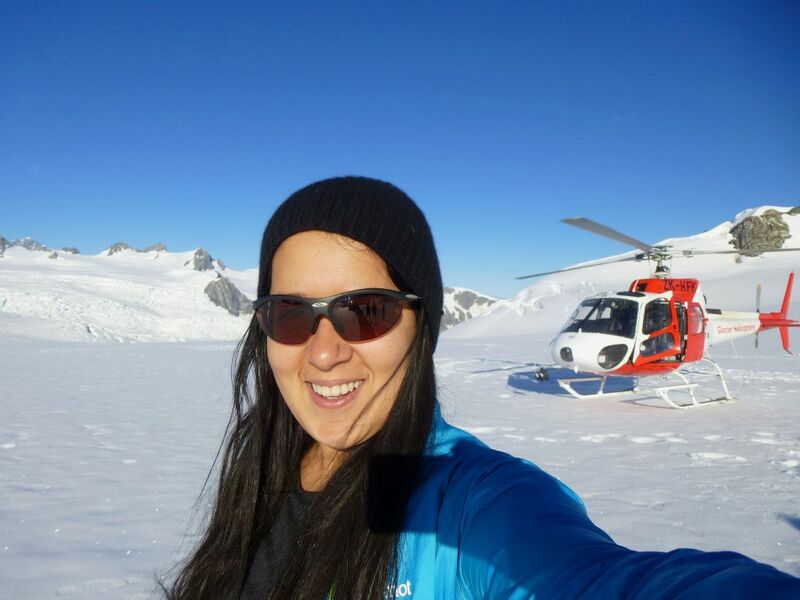 So anyway, for the princely sum of NZD 300 I got to do a 30 minute helicopter tour of the two glaciers. For that price I could have gone to Sydney and back so I hoped that it better be good. And it was pretty good fun although I hesitate to say that it was worth that much money. We took off from a nearby field and went high up into the mountains. There were three of us passengers so we all got a window seat. We had headphones via which we could hear the pilot speaking to us via an intercom system (it’s too noisy to hear him without them). We flew right over the glaciers for some stunning views. Apparently this is one of the only two places in the world where glaciers run into a rainforest, the other being the Patagonias. 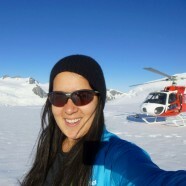 We landed on top of Franz Josef and hung out there for about eight minutes. It was very sunny and quite a bit warmer than I thought it would be. Towards the end my fingers started getting cold so I figure that you would need gloves and a few layers if you were going to go hiking up there. 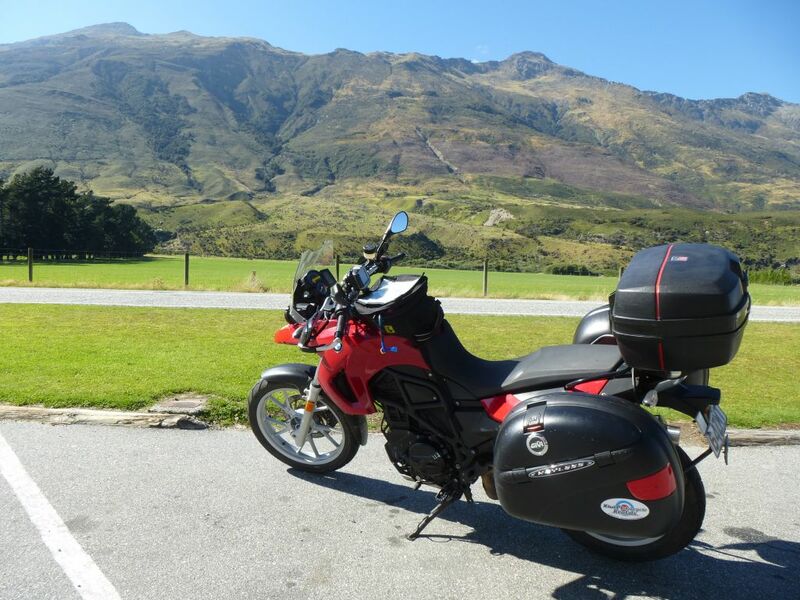 Today I rode from Queenstown to the little town of Franz Josef on the west coast of New Zealand via Haast Pass. I decided to face my demons and ride the Crown Range again since this road combined my two worst fears – riding a somewhat technical road courtesy of the seven hairpin turns after almost five years of not having done any technical riding, and my fear of heights. To be fair, I was on the mountain side going uphill so the fear of heights thing was a touch less dire than when I rode downhill a few days ago. Aaaand – it wasn’t as bad as I had built up in my head after all. I mean I was ridiculously slow on the hairpins and at the highest point, and I went wide on at least one of the turns, but I made it and didn’t crash or go off the mountain like my imagination had built it up for me. 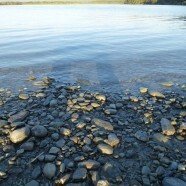 It was about an hour to get to Wanaka, same as the last time. There was some sort of festival going on in Wanaka but thankfully the traffic was going in the other direction so I didn’t get held up by it. I stopped quickly at the local supermarket – a delightful store like Whole Foods but way cheaper – and bought some peaches and mandarin oranges to replenish my fresh fruit supply. I ate a peach in the parking lot before taking off. The ride from Wanaka to Lake Hawea was lovely. I kicked myself for not stopping at Lake Hawea though, which was beautiful and a brilliant blue like all the other lovely lakes I’ve seen in NZ so far. This was to be an on-going regret for the day because there were so many many gorgeous scenes for which I wanted to pull over and just gaze and take a million photos but there was either no place to pull over or I didn’t think of pulling over in time. Oh well, I’ll just have to come back again. The most gorgeous section of the ride was when I was winding through Lake Hawea and Lake Wanaka and then over to Makarora. I’m talking gob-smacked, I-can’t-believe-these-epic-vistas type of scenery. And what amazing twisties! And such glorious weather! I’m a lucky lucky girl.